In the framework of a project about the youth in Western Balkans jointly organized by the International Institute for Peace, the Renner Institut and the Austrian Institut for International Politics we had a 3 days trip to Prishtina, Skopje and Belgrade. Some of our young participants from the Western Balkans traveled with us and underlined the connections that exist between young people in different countries of the region. Generally, their relations are more easygoing and productive if compared to relations between politicians. Nevertheless, because of still severe restraints for Kosovars to travel to Serbia not all could easily travel. This is something interesting if we consider that Serbia still insists that Kosovo is a part of the country. This conflict overshadowed some of our discussions. In recent weeks and still these days, there is a lot of unrest across Balkans cities. Especially the young - but not only they - are expressing their dissatisfaction in demonstrations. The authoritarian political regime is not something new to the Balkan countries. But a strong opposition is perhaps new. Concerning Serbia, the French newspaper Le Monde diplomatique underlined, that "once again Serbia is offering a spring in winter time - as in 1996/1997". But with political springs one is never sure if they are followed by summer or by a new winter, as we have seen with the Arab spring in Egypt. The demonstrations in Serbia are primarily directed against the autocratic President, Aleksander Vucic and especially against his media interventions. The rising number of cites in which these demonstrations are taking place seem to demonstrate that these manifestations will not stop soon. Albania's political scene is also characterized by demonstrations. Beside the young people, who demonstrated against rising university fees, the opposition went to the streets against the Rama‘s government. Opposition members even resigned from Parliament and demand quick new elections. Part of the opposition activities is motivated by the justice reform, which was long overdue and which is supported by the EU and the US. But also some autocratic decision by the government is a basis for the demonstrations. In Montenegro instead, the demonstrations are directed against the long-term political leader and again President of Montenegro, Milo Djukanovic. They accuse him of corruption and state capture. These accusations are not new. Finally, Bosnia and Herzegovina is governed for the moment by Milorad Dodik, long term autocrat from the Republika Srpska. Following the last national elections, he became the Chairman of the Presidency of Bosnia and Herzegovina. It will be interesting to see how he, who again and again announced a referendum about independence for the Serb part, will promote the country's path towards the opening of accession negotiations with the EU. Meanwhile, he is confronted with demonstrations against him for preventing clarification about the death of a young man, David Dragicevic, under obscure circumstances. Before we started our trip, flying from Vienna to Pristina, my personal "journey" started in Vienna. The North Macedonian Minister of Defence and Deputy Prime-Minister Radmila Shekerinska came, in fact, to the Austrian capital. On her suggestion, Austrian think tanks were invited to a dinner with her at the Austrian Defence Ministry. Correctly, Shekerinska underlined two basic and important changes in her country. Nowadays many speak about the finally successful negotiations between what is now called North Macedonia and Greece on the name issue. But there is another success, which is often neglected. Macedonia had, soon after its independence, strong clashes between the Albanian and Macedonian speaking population. A breakout of real civil war was feared. With the help of the EU, an agreement between the competing groups could be found and was named after the place where it was finalized: Ochrid. Nevertheless, Albanians voted for Albanian parties and Macedonian voted for Macedonian parties in the following years. In addition, the main right-wing Macedonian party promoted a nationalistic policy of underlining the Macedonian heritage by building many statutes also representing Alexander the Great. This "compartmentalization" of the country, which made the political system so rigid, decreased when the opposition SDMS started to look for votes in all ethnic/language groups in the last elections. There are still ethnic Albanian parties but major steps have been taken towards a more open political climate. This is important because ethnic/language oriented political systems are always inclined to tolerate or even support nepotism and corruption. And that was particularly true in Macedonia, which was a "captured state". Still, things are far from perfect in Northern Macedonia. Discussing emigration the low wages were mentioned as one reason. And here the Macedonian government already reacted: it raised the minimum wage in the country and it started some targeted actions to bring qualified people back into the country. Other reasons for migration are, for example, in connection with the meager leaving conditions. Poor health care, deficiencies in the educational system and high pollution are pushing young people and often their families out of the Balkan countries. In this respect, it would be necessary to increase investments and not concentrate on financing additional consultants. In particular, investments in infrastructure alone will not help to reduce emigration. This argument discussed in Vienna was confirmed by the discussions during our round trip in the region. Our trip started in Kosovo. The political debate in this country is characterized by a special political and legal issue. Therefore it is not easy for Kosovo politicians to deal with the main issues and concerns of Kosovo citizens. Kosovo is still not recognized as an independent state by five EU countries and there is no agreement with Serbia concerning its independence and its borders. In recent times, a land swap was discussed between the Kosovo President Hashim Thaci and Serb President Aleksander Vucic. Some part of Kosovo with primarily Serb population - the northern part of Kosovo - would go to Serbia and some predominantly Albanian population of Serbia would go to Kosovo. Besides being a farewell to a multiethnic state - alas with some small Serb community remaining inside Kosovo, such a land swap could raise emotions and new ethnic controversies in Macedonia and in the Republika Srpska. A new division of Bosnia and Herzegovina would be the result. It was relatively "easy" to reach independence. 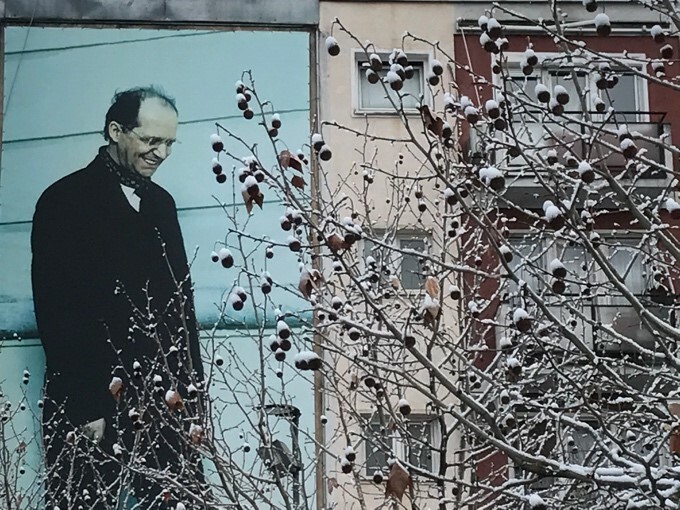 The mixture of the passive resistance of lbrahim Rugova, who later became the first president and today looks gracefully from a big mural in Pristina to its citizens, and NATO intervention (including the bombing of parts of Belgrade) forced Serbia to stop its "occupation" of Kosovo. Of course, also the Kosovo Liberation Army (KLA/UCK) with people like Hashim Thaci as leaders contributed strongly to the independence struggle. But all of them did not think about what should happen next. The multiple activities of the EU were also not very successful and could never substitute a forward-looking policy by Kosovo's political class. Such a policy is still not visible. When we arrived in Prishtina it was windy and cold. I feared even that the pilot would have to interrupt the landing and would have to look for another airport to land, but eventually, he managed it. There, the Friedrich Ebert Stiftung (FES) in Pristhina hosted us for an internal workshop and a public debate in one of the newer bookshop. The picture of the political scene, which was presented was rather bleak. Indeed, after so many years of independence - even if not recognized by all states, not even inside the EU - society is still blocked by political and economic forces, which are capturing the state and pushed many, especially young citizens, out of the country. In an opinion poll across the wider Balkan region, FES came to interesting but also contradicting results. The study will be published soon, but it seems that many young people - at least those who stayed in the country - are not dissatisfied with their life. At the same time, they have no trust in Kosovo politicians to create jobs and economic growth and to fight against corruption. The extremely high unemployment for the young generations is a major concern but they do not see many incentives to go into politics and change the political situation in the country. They rather prefer to emigrate in big numbers and look for better living conditions abroad. In addition, it seems that the wider family gives those young people who stayed support and an emotional background for an agreeable life. In contrast, politics as such fails to deliver the main ingredients for a decent life, which animates the young to continue speculations about leaving the country. The year-long fight for independence from Serbia, the struggle for winning as many countries as possible to recognize the new state and then the long and not very fruitful negotiations with Serbia overshadowed all the other tasks of Kosovo politics. And in the shadow of these struggles corruption and enrichment of few took place instead of working for the improvements for the many. It is understandable that in the specific situation of Kosovo a nationalistic sentiment is prevailing. Serbia, with its reluctance to recognize facts on the ground, is indirectly supporting this nationalism. But the interest of having an own state must be combined with offering not only legal and official integrative measures but also a new mind and preparedness of living together. On the other hand, the insistence of Serbia and Serb representatives inside Kosovo to keep and develop parallel structures inside Kosovo is not helpful. Of course, the different languages which also includes different letters and different religious allegiances are taken as justification for parallel structures - especially in the educational system - in Kosovo. But how should a common state be possible, if parallel societies with only few meeting and communication points are existing? Looking at these facts, a land swap seems to be the way out. But South of Mitrovica the Serb population is too much spread around the country, thus their areas could not be swapped. Moreover, negative effects on Macedonia and on Bosnia and Herzegovina could be enormous. Besides these effects, European countries must finally get used to leaving together irrespective of ethnicity, language and religion. This brings us to the case of Macedonia, which not only was finally successful in solving the name issue with Greece and minor issues with Bulgaria but was also able to overcome ethnic clashes at home. Already in Pristina, we discussed how far the Macedonian case could be an example and guide other countries of the region to a policy of mutual understanding and support. This discussion continued in Skopje. In the capital of Macedonia - or how it is now called officially North Macedonia - we had an inspiring meeting with the young foreign minister Nikola Dimitrov. He clearly stated that the narrative of fear has to be changed into a narrative of hope. And that the countries of the region have to have a competition for better education, health care and the environment instead of competition in "ethnic-mythology". Still, too many countries and politicians are stuck in their ethnic-mythologies, which prevents them to go forward and concentrate on vital issues to improve the citizens live. Macedonia succeeded to implement that transformation. First, the Ochrid agreement reduced the domestic tensions between the Albanian and Macedonian population of the country. And then the recent Prespa Agreement overcame the tension with Greece concerning the name issue. Before that - immediately after coming into power - the present government found already an agreement with Bulgaria and cleared the way for solving the vital conflict with Greece. Now hope exists in the country that the EU will honor this new policy with a decision to open negotiations with North Macedonia. But some fear that the EU Council is using the demonstrations in Tirana to postpone such a decision with North Macedonia and Albania with whom the country was informally "coupled" in the preparation to the enlargement process. In case Albania is not seen ready for the opening of negotiations, North Macedonia is ready for decoupling from the treatment. Looking at past enlargement waves, Estonia did the same going ahead with the opening of negotiations and the other Baltic states followed. The new government, who undertook courageous steps to find agreements with the neighbors, had difficulties to come into power. In the years before the elections, the former government misused its powers to organize what is now called a "state capture". A combination and cooperation of economic and political forces to undermine democracy and enhance a corruptive political system. Widespread eavesdropping and interference into parliamentary proceedings tried to weaken the opposition. The EU was much too timid in its criticism of these activities until they saw themselves forced to intervene and to moderate a transition to a new government. A book presentation at the Friedrich Ebert Stiftung was visited by us after the meeting with the Foreign Minister. 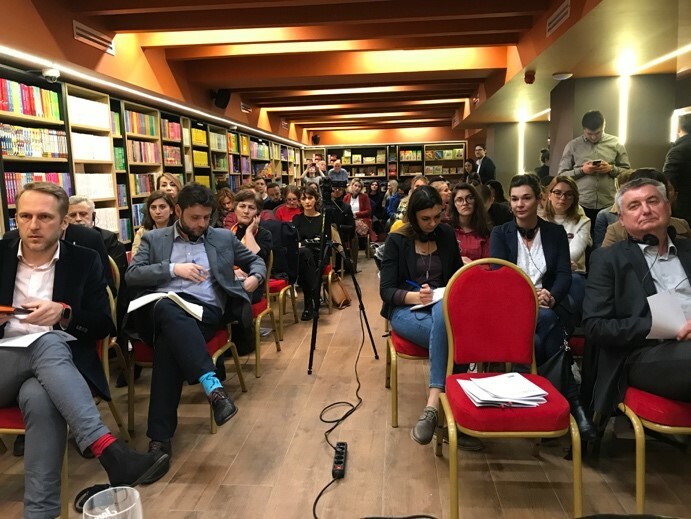 The author of "Captured State - Understanding the Macedonian Case" Mancho Mitevsky underlined that a state capture is characterized by a "criminalization of politics and politicization of crime": "Politically organized crime and the captured state are two parts of a whole. Between them, there is an organic connection, mutual conditionality and interdependence." A prominent international example of state capture was South Africa under President Jacob Zuma. But also inside Europe, we find many examples at least of trends towards state capture. Hungary is such a case and also Kosovo is said to be a case, even if it is not so obvious as it was in Macedonia. Overcoming state capture was an important precondition for finding an agreement with North Macedonia's neighbors. It shows that there is a close connection between domestic developments and the readiness to solve bilateral issues. And that leads to the discussion we had in Belgrade, the Serb capital. The Serb capital Belgrade presented itself sunny and much warmer than its sister cities in Kosovo and North Macedonia. But the political situation is not as sunny as the weather was. The authoritarian rule of the Serb President Aleksander Vucic is heavily criticized inside the country. Many young activists complain also that the EU is - in the interest of stability - uncritical vis a vis the democratic deficiencies, like the strong influence on the media. They speak about "stabilocracy" which is favored by the EU. One discussant in our public debate argued the EU is just asking leading politicians in the region not to shoot. And as long they are not using weapons to shoot at their outside "enemies", the EU is happy. This creates a bad image for the EU and is weakening those who are defending democracy and rule of law and are fighting high-level corruption. In any discussion happening in Belgrade, the Kosovo issue plays a role. Many of our interlocutors hoped for an agreement to be concluded soon. According to a survey done with young people, a majority expects that in some years recognition of Kosovo by Serbia will be the case. But it is doubtful if even the younger generation will gladly welcome it. What is certain is that the unclear and contradictory policy of the Serb leadership does not help to form a majority of people to accept recognition of Kosovo. But the longer, there is no clear line of political authorities visible, the more difficulties will arise once recognition is unavoidable. The same is true for the ambivalent strategy for joining the EU. Again, uncertainties and a double-speak concerning the EU on the one side and Russia on the other side is mirrored in uncertainties and a high number of "do not know" answers at opinion polls. Certainly, emigration was a big issue in our discussions. In many Balkan countries, the intention to emigrate is declining - with the exception of Serbia and Bosnia and Herzegovina. Whatever the reason for that decline in some countries, overall emigration is still very high. Asked about the motivation to emigrate, economic factors are not at the top. All the issues of quality of life from health care and education to pollution are the front runners in the hierarchy of reasons to prepare for emigration. The still existing wish to emigrate does not prove that all young people are unhappy at home. As they trust primarily their families and then their friends, this gives them some satisfaction and also an emotional backing. But that trust cannot at all be found concerning the public authorities. This distrust towards politicians does not transform and translate into a high readiness to join active politics. Political parties are seen too bureaucratic and demanding too many compromises. Even NGOs and other organizations of the civil society - which are definitely seen more trustworthy by the young - are not inviting many of them to participate in their activities. Another contradiction is the support for democracy and a request for more leadership by the authorities. One should not hope for young people to initiate and bring a big change. Populism - with or without state capture has still an open door with many citizens. The problem is that populism, especially in its nationalistic forms, does not solve the big economic and social issues. The case of Macedonia is a valid case of proof. As long as the government used the conflict with Greece as an enemy, as long state capture was accepted and vice-versa, no solutions were found. Only after the government overdid it and the international community, especially the EU lost its patience, the pressure to end state capture become strong enough. But of course, it was predominantly the people in Macedonia who started to revolt against state capture and the unbelievable extensive wiretapping. A clever policy of pressure from the outside and domestic resistance can bring change. And they can deliver results. This needs time and patience, but international support can help. Visa liberalization for Kosovars and opening of negotiations with North Macedonia would be necessary steps to enhance stability in our neighboring region. But also the opening of negotiations with Albania would help - especially in the present critical situation. The way towards membership in the EU will be anyway long. The EU should also - before accepting new members - implement radical reforms to make it more efficient and able to play a global economic and political role. The economic and political potential of Europa's unification is by far not used sufficiently. But if the EU and several national leaders would not be ready to take new members and to reform itself they should say it clearly in order to give the Balkan countries a chance to reorient themselves. It is still too early to present alternative horizons as our discussions with representatives of the younger generation in the region will continue. But it became - again - clear to us, that the widespread authoritarian rule, including cases of state capture, is preventing decisive steps forward to sustainable stability and development. Here the EU should define more clearly what kind of reforms it is expecting. With new authoritarian governments inside the EU, this became more difficult but not impossible. The EU is still a guarantor that deviations from rule of law are limited and basic democratic principles are preserved. But also inside the EU citizens activism and resistance cannot be substituted by EU institutions. More demands and more support should concern the living conditions of the citizens. These range from the fight against corruption to the environment, from job creation to social justice. Without interfering into internal affairs, the EU should show understanding and support for those citizens who protest against violations of human inclusive social rights. And the EU should - together with the governments of the region - elaborate a viable concept of circular migration. Instead of forced and often permanent migration efforts should be undertaken to promote transitional emigration with incentives to come back. Also in this region, we can find an ideological fight between Russia, Turkey and partly already China. None of them is investing more than the EU. But - what is more important - none of them is offering a better and more democratic future. The EU should not be afraid of entering into that competition. To be convincing, the EU should not compromise on what it can offer to the youth of the region The EU should present alternative horizons with support for democracy, better education, health services and job opportunities. Older PostVideo & Report: "EU-Russia Dialogue. Vienna Process 2019"